Brows To Nails would like to welcome you to IBX ! A completely new Revolution in nail repair! 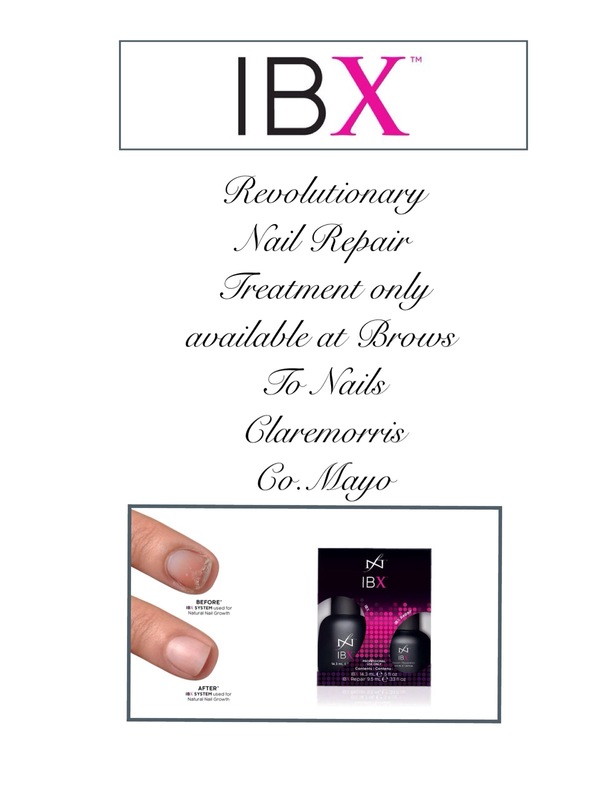 For the first time ever Brows To Nails Claremorris Mayo can repair weak, brittle, and even severely damaged nails. “It’s a totally brand new product and Brows to Nails Mayo is delighted to be one of the first to be introduced to this fabulous formulation! The IBX System uses heat and light to help penetrate a blend of jojoba and avocado oil plus toughening agents deep into the nail, where it forms an ‘interpenetrating polymer network’ that fuses the nails’ top layers together with little flexible polymer links. The result? Hydration is locked in. Nails are strengthened. Peeling stops, splitting stops. White spots disappear. “But it will also repair severely splitting, peeling, and ridged nails, and turn yellow nails into pink nails again,just in a few treatments.Having had problems with growing my own nails in the past I have found since using IBX that my nails have simply got stronger, pinker and more resistant to drying out and peeling, which is giving me longer and stronger results! The days after I treat my nails I can see they are still gleaming. They look glossy even straight out of the shower: water doesn’t seem to penetrate and soften them. They’ve returned to their original pink and-white hues of yore, and there’s no more splitting or breaking. And that’s all in a single treatment. If you want fabulous nails call Paula today at Brows To Nails Claremorris Mayo on 087 9875467 or simply message me on my facebook page,I will be only too glad to answer any questions you may have!